Prices valid for Peak periods. Canazei is the place to go for a real "ski adventurer", on his/her next ski holiday. The skiing experience in Canazei is one of a kind with towering 3000m peaks of the Dolomites surrounding this astonishing ski resort. With more than 1200 kilometres of skiable terrain, you are guaranteed to never ski the same place twice during the day. With its world-class skiing, first-class cuisine and an after-ski which will serve throughout the night, Canazei will do its very best to take your breath away when going on your next ski holiday. The ski resort of Canazei is part of the ski region of Val di Fassa. Val di Fassa is a small valley in the south of the Dolomites which includes the ski villages of Campitello and Moena. Val di Fassa is connected to a vast connected skiing area with more than 1200km of slopes known as Dolomiti Superski. Dolomiti Superski and incudes notable resorts such as Val Gardena, Allta Badia and Cortina d’ Ampezzo. All skiresorts within the Dolomiti Superski, are linked as pearl on a string around the Sella Ronda massif. Canazei is not a ski-in/ski-out resort, but the aid of a massive gondola. The gondola takes skiers from Canazei takes skiers to the summit of Pecol at 1926 metres. Half a dozen more ski lifts, including the Pecol Col di Rossi cable car and an intricate series of chairlifts, takes the skiers to the highest point of Val di Fassa, Saas Pordoi at 2950 metres. From Campitello, the cable car takes skiers to Col Rodella at 2485 metres. Canazei skiing has some of the finest and professional experts when it comes to creating artificial snow. Their tireless efforts in snowmaking and grooming are one of the best in the world, as it is of utmost importance to ensure the area remain interconnected. The snowmaking teams within Canazei and all of the Dolomiti Superski are capable of providing skiable slopes, even though the surroundings are showing a brown shade with exposed winter grass. The scenery is breathtaking as the towering mountains offer some of the best views while skiing. Canazei is wedged into a narrow forest cleft and massive rocks towards the far end of the Val di Fassa. The resort is an excellent choice for intermediate skiers. The ski domain is provided by the extensive Dolomitic Superski Lift system that offers 1200 kilometres of muscle-melting piste. Canazei has a fair share of pistes that are extensive, broad and confidence boosting. 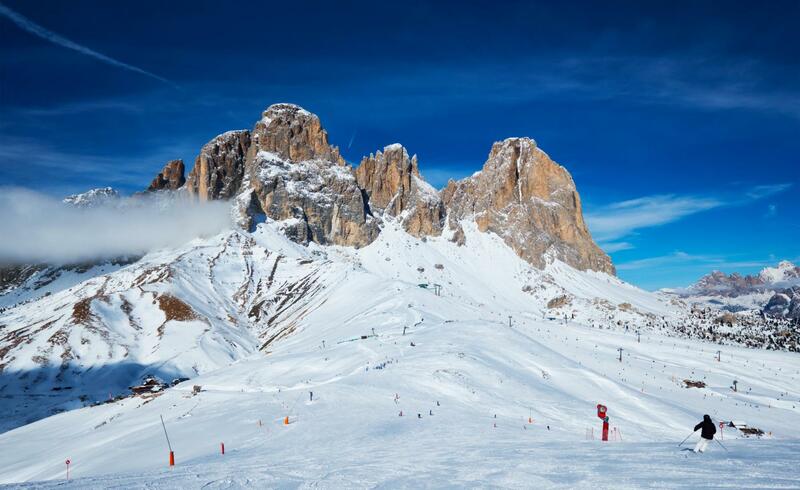 The Sella Ronda circuit is one the most popular courses for every skier visiting Canazei. The circuit is a must try for intermediate skiers. The circuit is completed in two ways, clockwise or anti-clockwise. Starting from any of the four valleys, the clockwise loop has orange signposts while the anti-clockwise has green signposts. This particular skiing area is known for its modern ski lifts and a massive 14 miles of piste that quickly reaches the town centre. The Belvedere is a famous Dolomitic snow park. Located right in the middle of Canazei are the main nursery slopes for beginners and a dedicated snow park for children to enjoy and learn skiing. For beginners, the perfect nursery slope is served by a small drag lift with easy runs. The Pozza di Fassa Vajolet and Pian Peccei Pramartin chairlifts give access to a variety of cruising blue slopes and easy reds. Beginners will have several chances to perfect their skills in this perfect spot. Canazei is a paradise for intermediate skiers as most of the pistes offer an exceptional experience for them. Taking the gondola uphill towards Pecol will help warm up skiers for an extended cruise over the Belvedere. After completing some laps at the park, skiers can go downhill to Pian Frataces. If the weather conditions are suitable, skiers can get the off-piste right through the trees. In the afternoon a small trip towards the open bowls of Sella Pass is a good run for intermediate skiers. The Sella Pordoi Channels provide something special for the more adventurous skiers. Fans of ski mountaineering can start their adventure at Canale Holzer, right at the peak of Sass Pordoi. Following the crest leading towards Forcella Poidoi by a cable car. Skiers then enter a gorge towards the west of Rifugio Maria (2950m). Another route takes skiers from Punta Penia from Ciampac and path 602. Skiers usually take path 610 towards Val Rosalia along the western crest of Marmolada till the Marmolada crossing. This route continues towards the Penia peak. After reaching the summit, skiers can descend to Schena de mul located north of the mountains, leading skiers to the massive glacier where Rifugio Pian dei Fiacconi is situated. Using a chairlift, skiers can move onwards to Fedaia Lake. Canazei is the largest resort in the Italian Dolomites. The ski resort is one of the largest and the main attraction in Val di Fassa. The ski region of Canazei offers the best experience for skiers, and the town has one of the best après ski activities in the entire area. This is the ultimate destination for those who want to party after an adventurous day on the slopes. Canazei has many hotels that offer their own nightclubs and bars. Below are the must-see bars and pubs for the perfect après ski. This nightclub is the perfect choice for dancing and fun after spending the day skiing. The club has great dance floor, and it’s usually jam-packed with tourists. There are different rooms and halls with varied themes catering to every need. This is the main party center of the resort. The Apres Ski Paradis is the go-to place for skiers to spend the night dancing and enjoying drinks. This is probably the only bar in town where bartenders are dancing on their tables while guests dance in their snowboard boots on the dance floor. The bar has a wide range of cocktails and drinks with excellent tasting beer. This bar/club allows dancing on tables. The timings of the bar/nightclub are somewhat short. The place opens at 2:30 PM and closing time is 8:30PM, which isn’t good news for late night partying. Another favorite place for après ski is the Taverna Espanola. This is a historic pub with a Latin theme right in the center of Canazei. Skiers reach the bar quickly as it is located at the return slope towards the forest. It is the perfect pub for spending quality après ski time with friends after a fantastic skiing day in the Dolomiti SuperSki area. The bar has different events that engage the guests in fun activities, and sometimes there even are prizes to be won. La Taverna Espanola has live music that will get everyone in the mood for singing and dancing. This bar is versatile and it offers all kinds of drinks and beers to suit all tastes. The bar has a separate section for smokers and is famous for playing live music and a big party that promises the best live music in town. The bar has excellent tasting pizzas for a bite with drinks. The dance floor is always packed with skiers. The skiers in the Belvedere section of the resort can enjoy drinks with delicious snacks at Gran bar Pecol. This bar is relatively quieter compared to pubs and bars at Canazei, but it is a right spot for après ski in Belvedere. This bar is used as a resting station by skiers returning back to Canazei. For skiers in need of a break in the Pozza Buffaure ski region, this bar is a perfect choice. The bar is located on the other side of the valley, and it is an ideal place for sports or a fizzy beer while watching the sunset in this beautiful region. For wine lovers Canazei has one of the best places for excellent wines, the Enoteca Valentini is located in the central Canazei district. The bar is owned by Sergio Valentini, an experienced UIAGM guide, so he knows what skiers look for in their wine. The bar has a wide range of exquisite wines with over 800 varieties, mostly from the Alto Adige. The climate of Alto Adige is perfect for wines with hot temperatures during the day and chilly nights, which is perfect for making the ideal fragrant sparkling wine. Canazei is a beautiful ski resort in the famous Italian Dolomites. The retreat is ideal for skiers and snowboarders, but Canazei resort offers many other activities for families and children that makes it one of the most sought-after tourist destinations in the world. Tourists from all around the globe visit Canazei to experience the vibrant Italian culture and to know more about the region. One of the most favorite non-ski activity among skiers and non-skiers is visiting the different health and wellness centers offered by various hotels and independent centers located across the central Canazei district. Apart from a large number of private centers, there is a famous public wellness center in Canazei called the ‘Eghes Wellness Center.' The center offers different facilities like warm baths, saunas, massages and a heated swimming pool. Several beauty treatments and Therapies will give you a refreshing mind and body, all set for a perfect day of skiing. To move away from the stress of your daily routine the Canazei offers the best winter walks with the astonishing backdrop of the fantastic Dolomite mountain range. The winter landscape of the Canazei is perfect for a snowshoeing walk. There are different walking itineraries offered by local guides and hotels in the Canazei. The hike through the forests is an experience for everyone in the family or a group of friends. The trails are ideally located, and each walkway has an exclusive restaurant or a place for pit-stops where they can enjoy a quick bite or a drink. The Canazei resort has different stores offering a wide range of shopping items for everyone. From clothes, flowers, sports, ski gear, snacks, furniture and much more including traditional handicrafts. The resort has a different selection of wine stores and cheese; that make the perfect souvenir to take along for your friends back at home. This event is a favorite among European skiers. Each year thousands of Europeans rush to participate in this event. The event involves running in the mountains stretching 13 miles. The Sky race begins at Canazei and moves towards different routes, pathways with ski slopes and gravel paths leading towards Passo Pordoi. The next point is Piz Boe and then a return trip to Canazei. It is one of the most popular international mountaineering events in Europe. The event is part of a Skyrunner World Series that challenges athletes from around the world for a complex race. The event marks the celebration of wine and beer of the Val di Fassa Region. The event is held in Canazei every year, and it offers traditional domestic dishes with wurstel, polenta, sauerkraut, potatoes, and smoked and grilled meats. The live music adds another dimension to the festivities. This event is perfect for sighting and enjoying the local traditional clothing and culture. The New Year Eve celebrations at Canazei are one of the best in the world. The resort is filled with partygoers, dancing to the thumping beats blazing loudly from the giant speakers. The Christmas decorations are an unforgettable sight when combined with colourful fireworks to mark the New Year Eve. The children can enjoy learning skiing in the two leading ski schools in the Canazei Resort; Canazei Marmolada Ski School and the Campitello Ski and Snowboard School. Each school offers special classes for children where they are taught under expert supervision, and proper safety measures are applied. Children enjoy these classes, and it is a great chance for parents to have some alone time while the children are busy taking their skiing lessons. Both the schools in the Canazei resort have professional and experienced instructors for children. They offer specialized training and coaching for children. The classes are organized well with contemporary facilities. There is a dedicated skiing area for children to practice their skiing skills. Marcialonga is one of the most popular events famous around the world for cross-country skiing enthusiast. The Marcialonga is the most important event held in the Dolomites of Italy. The cross-country event begins at Moena and moves along Avisio towards Canazei. Then from Canazei, the race continues till Val di Fiemme until it gets to Molina di Fiemme. This race attracts thousands of participants each year. The crowd includes families and expert skiers who participate in this adventurous event. Tourists love food, and Dolomites food has gained quite a reputation internationally for its authentic taste and fresh ingredients. The Fassa Fouri Culinary Event is a popular cooking competition that is a favourite among the tourists. The event is held every September where ten talented and skilled Dolomiti chefs compete for a prize. This is an open-air event located in the Val Di Fassa flowery meadows. It is a perfect experience for a picnic to enjoy delicious food. There are also some formal dinners with live music and other theatrical events. Popular ski resorts in Italy Looking for ski trips and vacation packages to Italy ski resorts? Have lots of fun skiing in Italy!